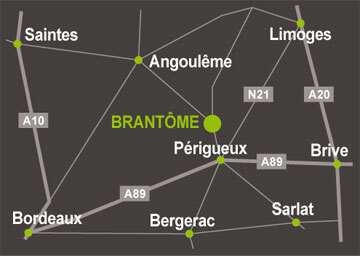 – From Paris: Either take the A20 to Limoges then the N21 to Thiviers, then follow the signs to Brantôme on the D707 followed by the D78. Or take the A10 towards Bordeaux until you reach Poitiers, then take the N10 until you reach Angoulême. At Angoulême, take the D939 to Brantôme. – From Bordeaux: Take the A89 towards Brive-la-Gaillarde until you reach exit 14, then follows the signs to Angoulême and finally Brantôme. 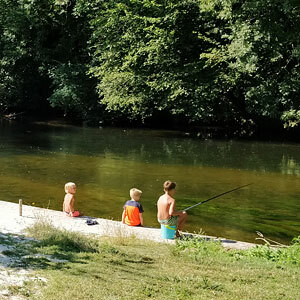 – From Clermont-Ferrand: take the A89 to Périgueux, exit 15, then in Périgueux follow the signs to Brantôme. BY TRAIN: TGV (high-speed train) railway station in Angoulême.